How the weather changed Huh? Same as last year, children start their school holidays and it all goes pear shaped. I hope it picks up again soon. Have you found any bargains in the sales yet? I have found some great priced stuff out there, and purchased a few bits, we are decorating our spare room at the mo and money is tight, so the sales are a godsend to me. I did find some bargain priced white jeans, I was on way to buying a pair from M&S and having a browse in each shop on the way as you do and hey presto! found a pair I really liked. I purchased these from Pilot. For a bargain sale price of £18.00 They fit well, have Lot’s of stretch and most important there not see through! Gave up trying to take a decent photo of the said jeans in the end. Fed up with either getting totally wind swept or soaking wet, resorted to the good old selfie! The other half was happy about that too. Oh and I’m really happy with this little navy top I found in Top Shop too. 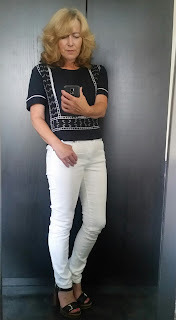 I love white jeans, and love the way you have styled them, even when the weather is so dodgy at the mo! 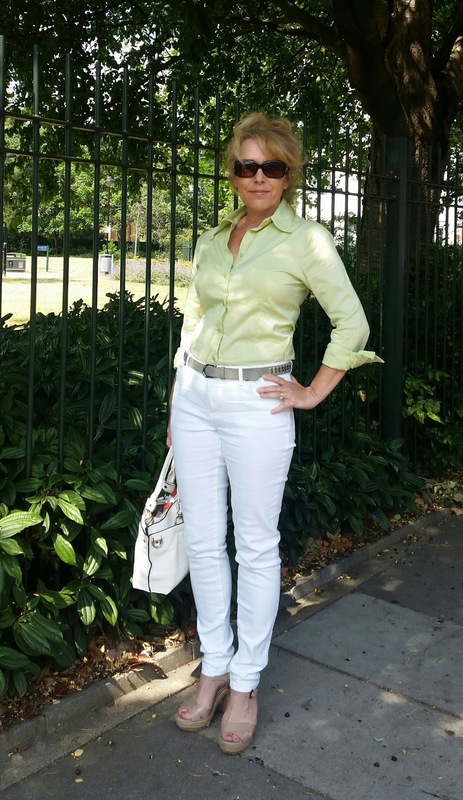 Your white jeans look fabulous on you! I have a couple pair and find they are great in the summer. Love the different looks and the green top looks so fresh and summery! I love white jeans. I so want the weather and the occasion. So much of my time is office bound or jobs at home. You look great and good for you wearing them at every opportunity.